New data show that almost half the teachers at LA Unified’s lowest-performing schools have not been evaluated for at least three years, and nearly all of those who were had received favorable ratings. Now the school board’s vice president is calling for more regular evaluations, which he said could require negotiating changes to the city’s teachers union contract. Teachers have been working without a contract for over a year. Early this month, United Teachers Los Angeles declared it was at an impasse with the district in its negotiations. Then the union reversed itself and said talks could resume this week. “As a former teacher, I know evaluation is a tool for improvement, and I think it’s important that teachers as professionals are regularly evaluated to know where they’re strong and areas of growth, so the idea that we’re not evaluating our teachers is not just a disservice to the kids in our schools and their families but also to the teachers that can really benefit from understanding how to continue to improve,” Nick Melvoin, the board’s vice president, told LA School Report. 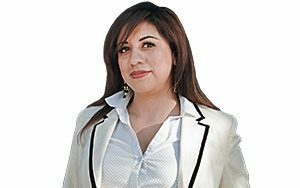 Board president Mónica García declined to comment on the teacher evaluations and the union contract. While over 70 percent of the students attending the 44 lowest-performing schools in the district are not proficient in either math or reading, 46 percent of their teachers were not evaluated at all from 2014 to 2017, says an analysis of district data by Parent Revolution, a nonprofit education advocacy organization in Los Angeles. Only one of those schools evaluated more than 50 percent of its teachers, according to public records revealed just weeks after the end of the school year. Parent Revolution obtained the data in the spring through a records request, showing that in the 2016-17 school year, 7 out of 10 teachers working at those 44 schools were not evaluated, even though only 27 percent of students at those schools were proficient in English language arts and only 20 percent were proficient in math. 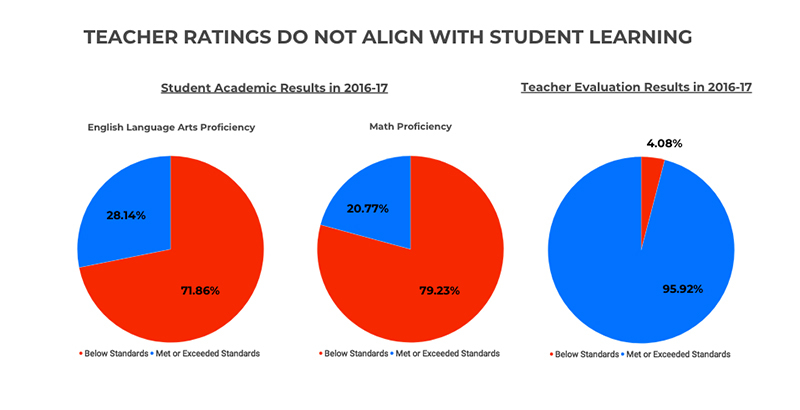 Those schools are rated at the lowest two categories — red or orange — in reading, math, and English learner progress on the California School Dashboard, the state’s accountability system that launched in the spring of 2017. Only one of the 44 schools showed any improvement in reading from the previous year, and 31 of the schools showed worse results. The 44 schools together served 25,589 students in the 2016-17 school year who were taught by 1,316 teachers, of whom 899 — or 68 percent — were not evaluated that year. 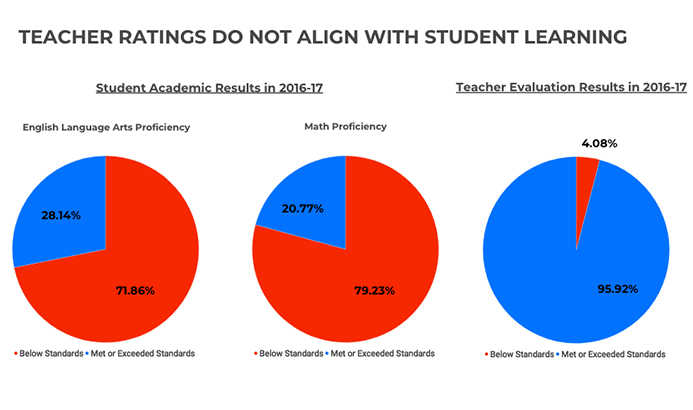 Of the 417 teachers who were evaluated that year, 400 — or 96 percent — were found to meet or exceed standards, while 17 teachers were rated below standards. From 2014 to 2017, 23 of the schools gave every teacher who was evaluated a satisfactory rating. Melvoin said the district has tried to strengthen teacher evaluations, but the teachers union has taken the district to court over making students’ test scores part of teachers’ job performance evaluations. In 2013, former superintendent John Deasy moved to make test scores 30 percent of teacher evaluations, but UTLA filed an unfair labor practices complaint. The union and the district eventually agreed to include test scores as part of evaluations but did not agree on a specific numeric requirement. He said the district knows how long each teacher at those schools has worked but Parent Revolution did not receive that information because of contract rules. In an email explaining the district’s evaluation process, an LA Unified communications officer said the district’s evaluations rely on multiple measures, including classroom observation, conferences, professional goal-setting, and a series of reflection activities throughout the year. Data from the National Council on Teacher Quality show that 52 percent of the nation’s largest school districts do not require that all teachers be evaluated every year. It found that all 123 of the largest districts evaluate inexperienced or non-tenured teachers at least once a year, but districts do not see that need for more-experienced teachers. In over half of the districts, tenured teachers can go two to five years between full formal evaluations, as long as their previous evaluation rating was proficient or above. In the interim, many districts evaluate these experienced teachers using abbreviated evaluations, such as only using student growth data or bypassing some of the metrics, according to NCTQ, a nonpartisan research and policy organization committed to modernizing the teaching profession. The organization states that because a teacher’s job is multifaceted, they should be evaluated using multiple measures that capture different elements of their practice. It says evaluation ratings are more stable and better at identifying more effective teachers when they combine three general measures: professional practice, student growth, and student survey data. Twelve districts — mostly in California — evaluate teachers on only one measure: professional practice, which is based on a teacher’s classroom observations, the organization found. This spring, members of Parent Revolution’s Parent Power Network asked LA Unified board members to review the current improvement plans at the lowest-performing schools. They presented the board with examples of what they saw as poorly constructed school plans, which had been approved by the district. At the June 12 board meeting, a majority of board members acknowledged that the improvement plans the parents had shown them are incomplete or insufficient and that they had been approved without proper oversight. In a resolution the board unanimously passed at that meeting, “Realizing the Promise for All: Close the Gap by 2023,” the board has directed the district to develop tougher school site improvement plans and to exempt the principals of the lowest-performing schools from having to hire off the district’s “must-place” teachers list.